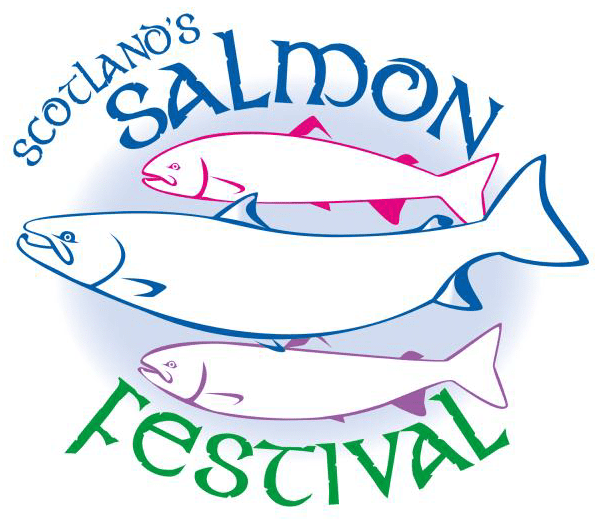 The country’s no 1 export, Scottish Salmon was as popular on home ground during last weekend’s Scotland’s Salmon Festival Fair in Inverness. 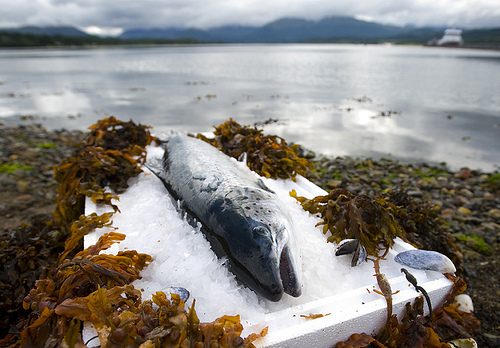 The Marine Harvest Kitchen was a popular attraction for adults and kids who came to learn about Scotland’s salmon farming industry and wild salmon fisheries; and of course to find out more about cooking with Scottish Salmon. 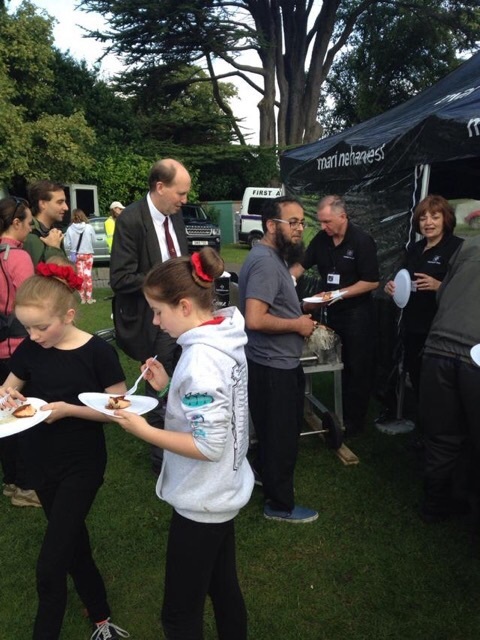 Held on the banks of the picturesque River Ness, the fair offered a range of activities including cookery demonstrations, educational activities, fly tying and an international casting competition. 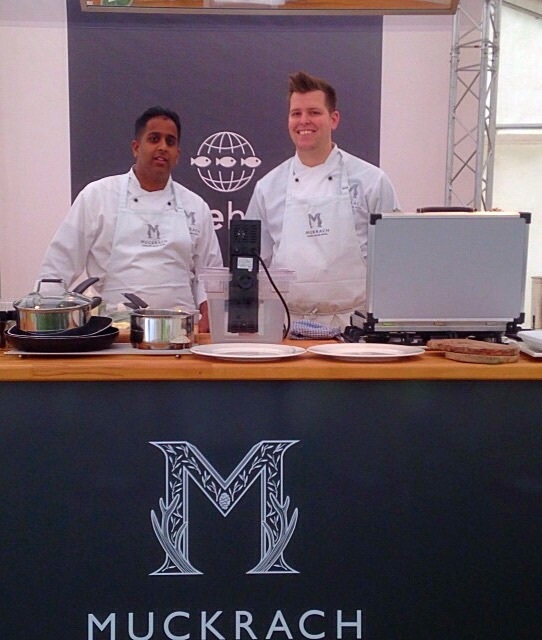 It was an event for all the family and of course the highlight for me and all the food lovers was indulging our taste buds with the array of mouthwatering salmon tasters cooked up by the three local chefs in the Kitchen Theatre. 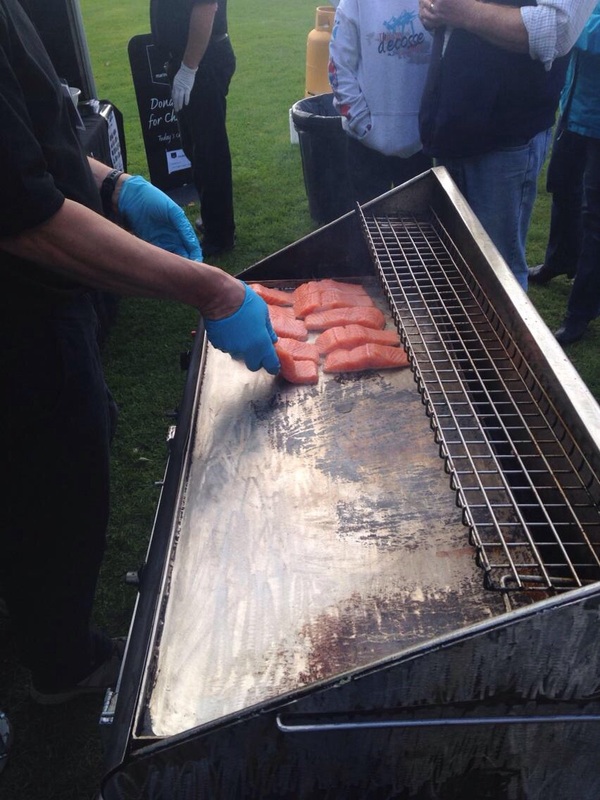 And, to keep hunger at bay, a healthy but fast food option of grilled salmon was on offer at the Marine Harvest BBQ. 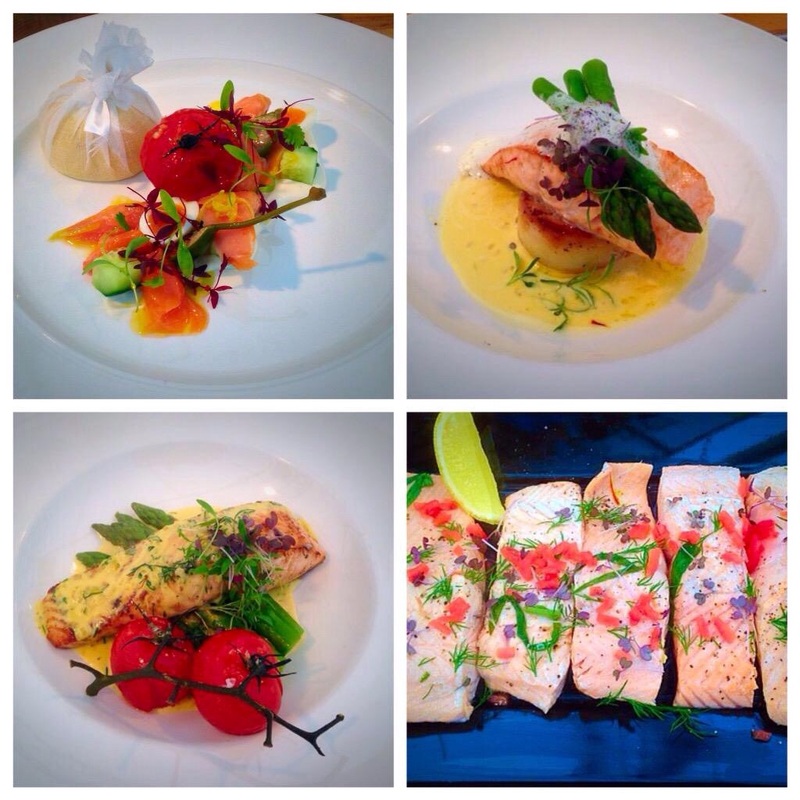 Throughout both days the chefs demonstrated a range of dishes using seasonal and local produce, with all dishes showing the versatility of Scottish salmon when it comes to cooking and in particular, how well salmon works with so many different flavours and cuisines. 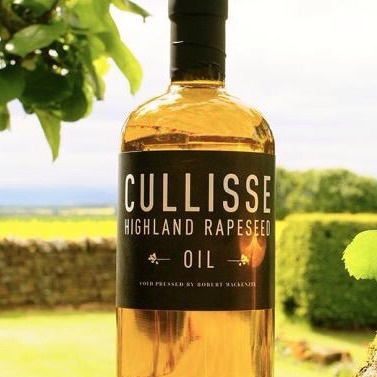 In keeping with their love of cooking with fresh, local and seasonal ingredients, all the chefs used locally produced rapeseed oil from Cullisse on the nearby Black Isle. 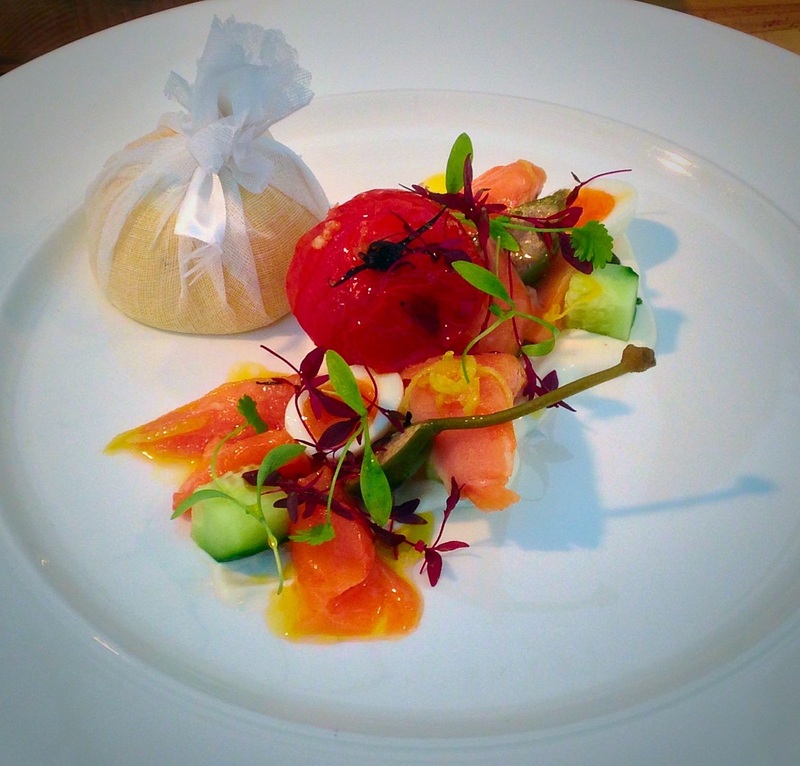 Head Chef Rayner Muller and sous chef Johan Sikkema of Muckrach Country House Hotel had the wow factor with their dish of confit Scottish Salmon with a horseradish cream, roasted cherry tomatoes, quail eggs and caper berries. 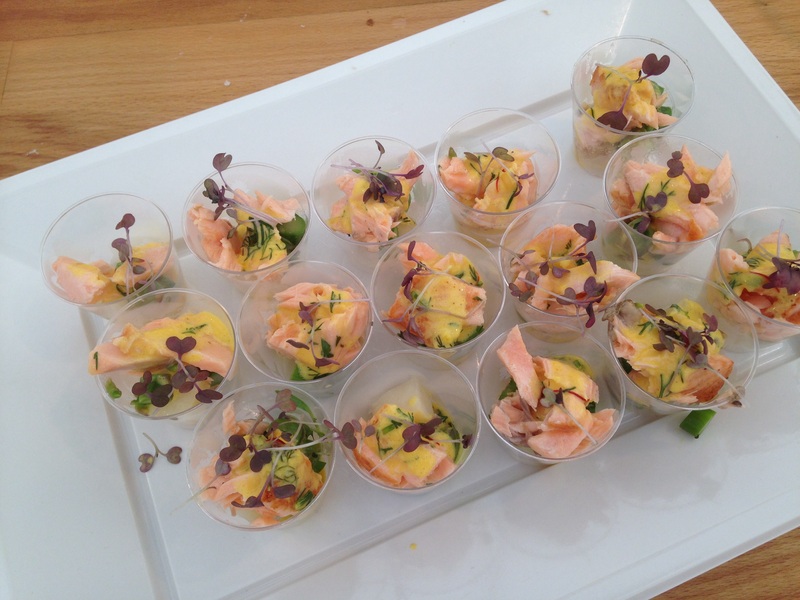 The dish was finished with micro herbs corriander and red amaranth. 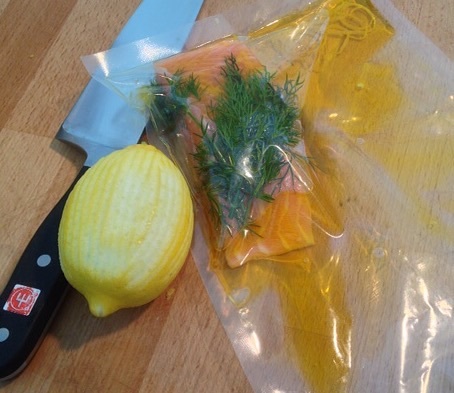 The salmon was vacuum packed with rapeseed oil, lemon and herbs and cooked sous vide. 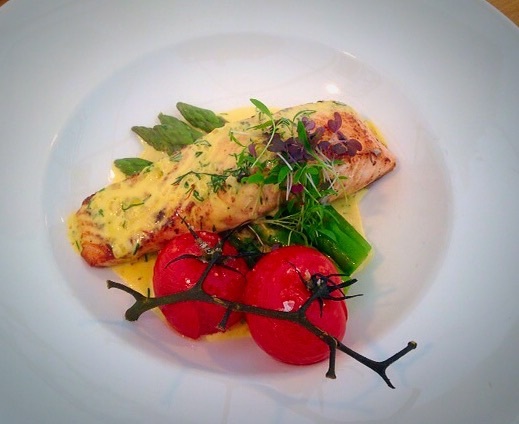 This was the first time I had tried salmon cooked this way and everyone agreed that it produced perfectly cooked salmon with a delicate texture but packed full of flavour. 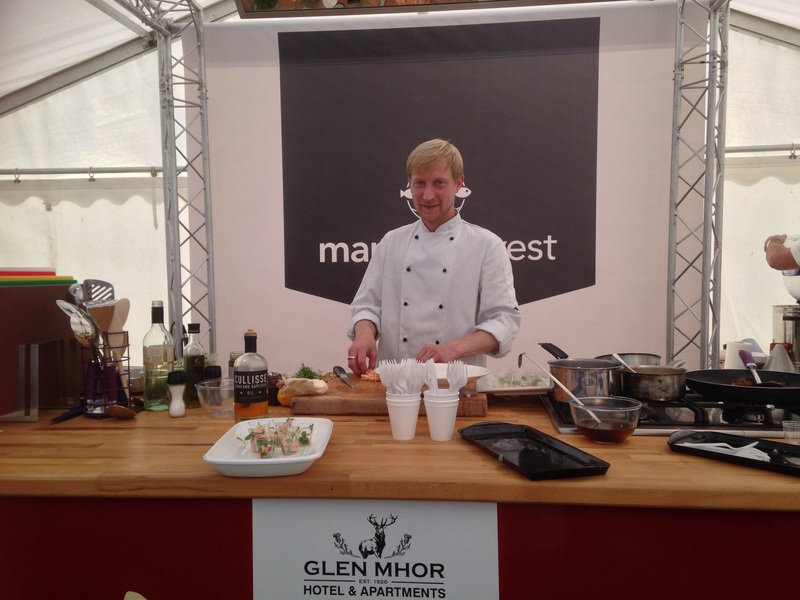 Martin Ewart, Head Chef from the Glen Mhor Hotel in Inverness cooked a selection of salmon dishes and like his fellow chefs, impressed the audience with a variety of dishes using a wide range of flavours. 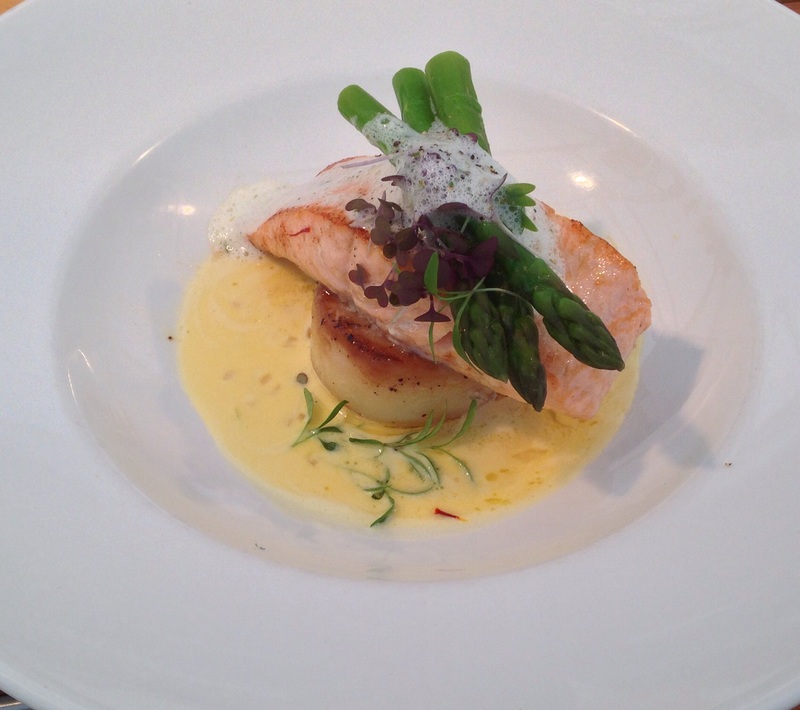 The star of Martin’s demonstrations was his Scottish salmon with a baked fondant potato, saffron cream and asparagus. He finished the dish with a drizzle of black truffle oil which worked perfectly with the overall dish, the strong earthy flavour adding depth of flavour. Martin also also demonstrated some dishes with poaching and baking salmon including tips for cooking sauces and adding flavour to the fish. 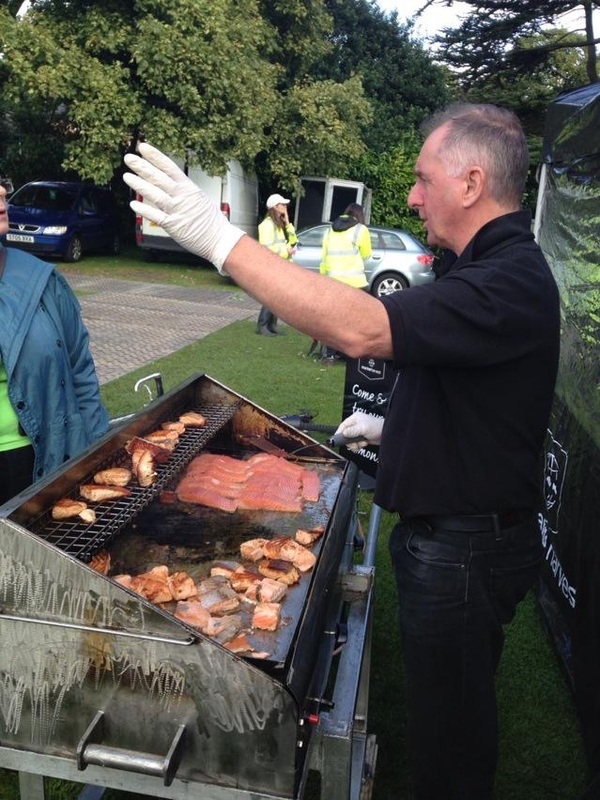 During the demonstrations I was in the Kitchen Theatre chatting to the chefs and the audience and not surprisingly it was the local schoolkids who surpassed themselves with their knowledge of healthy eating and a few happily shared their favorite ways for eating salmon. 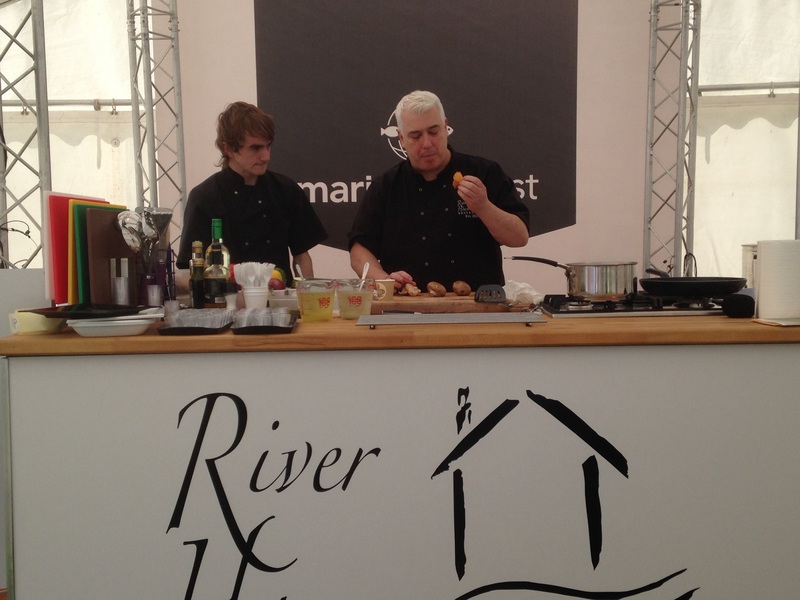 Chef Alfie Little of the Riverhouse Restaurant in Inverness started his demonstration with a salmon dinner in a dash; amazing the audience with the speed at which a salmon dinner can be on the table. 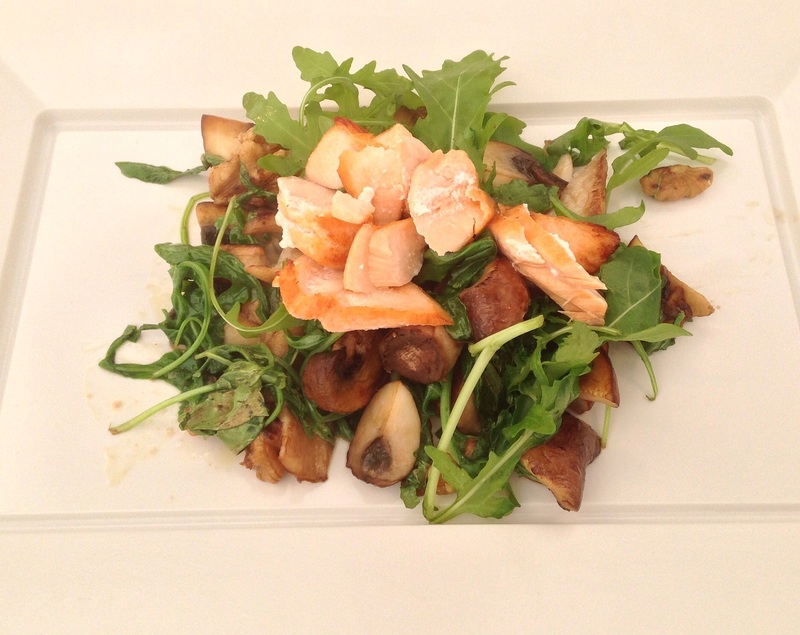 It might have been fast food but his Scottish Salmon with earthy tasting foraged mushrooms, walnuts and a rocket salad was full on flavour. The addition of black truffle oil was the perfect finish for the dish. 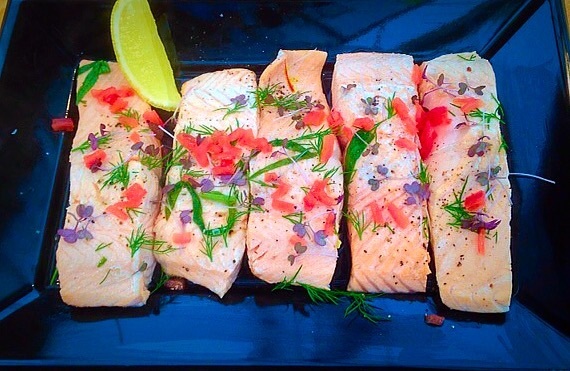 All ready in 10 minutes it was an ideal dish for showing the simplicity of cooking quick meals with salmon. 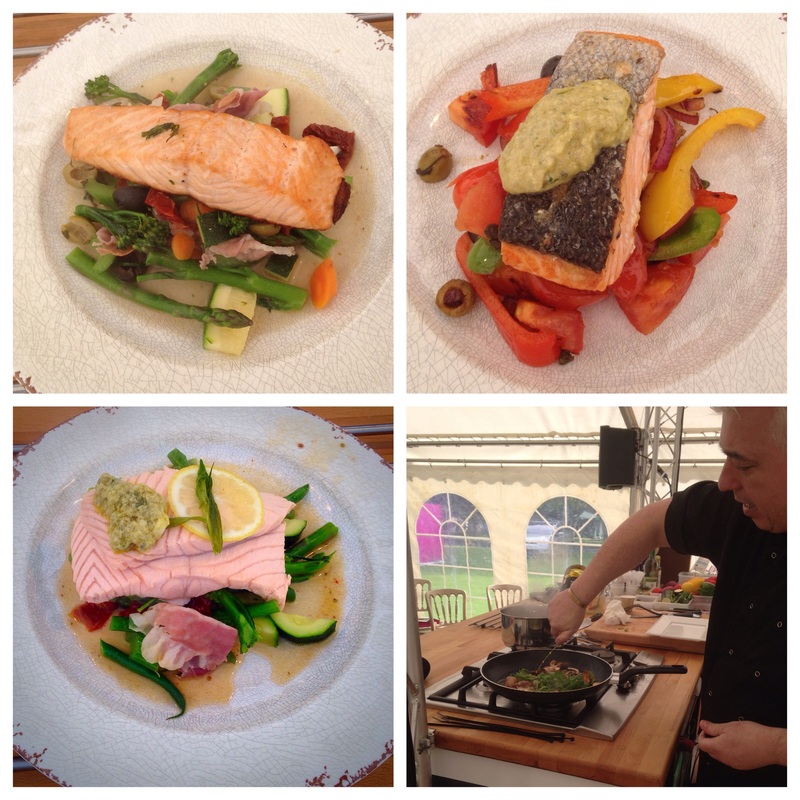 Alfie’s other dishes included poached and pan fried salmon and each dish gave ideas for making the best use of seasonal vegetables, excellent for those trying to find different ways to pack in their five a day. 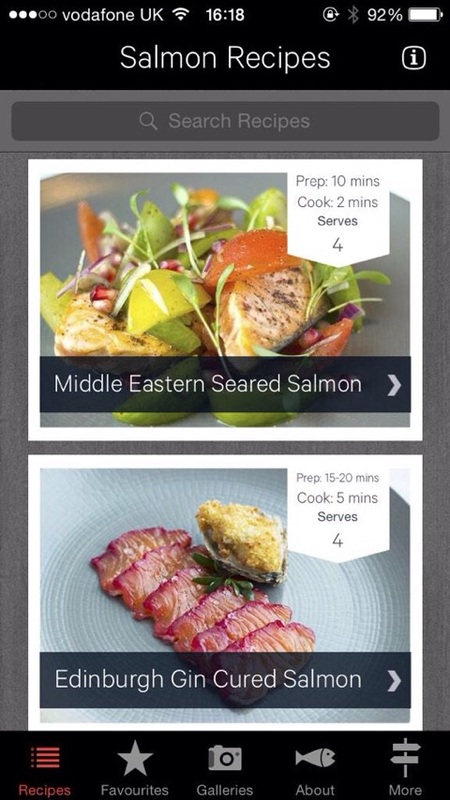 The Marine Harvest App has an outstanding collection of flavour packed Scottish Salmon recipes to inspire your cooking everyday, from quick midweek meals to exciting meals for special occasions – you can upload from the link below. 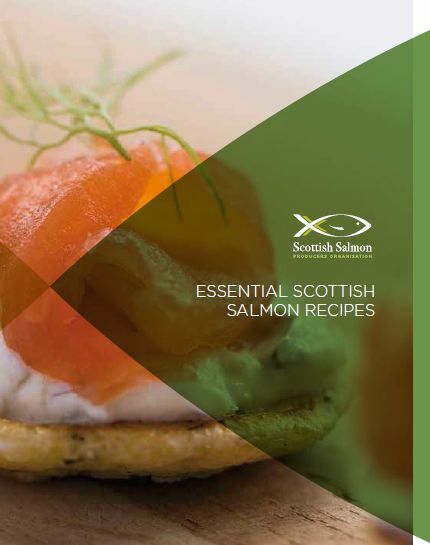 A new recipe booklet available to download from Scottish Salmon Producers Organisation has a selection of recipes to inspire you to make the best of Scottish Salmon for everyday meals. Thanks to Gary Coutts for BBQ pics.